The need for high-density electrical connectors is being driven by applications that need smaller, lighter connectors that are also ergonomically friendly. However, adding more pins in a connector is not a straightforward process. With IEC specifications and other safety regulations, designing a high-density interconnect that is not unwieldy or cumbersome is a challenging task. 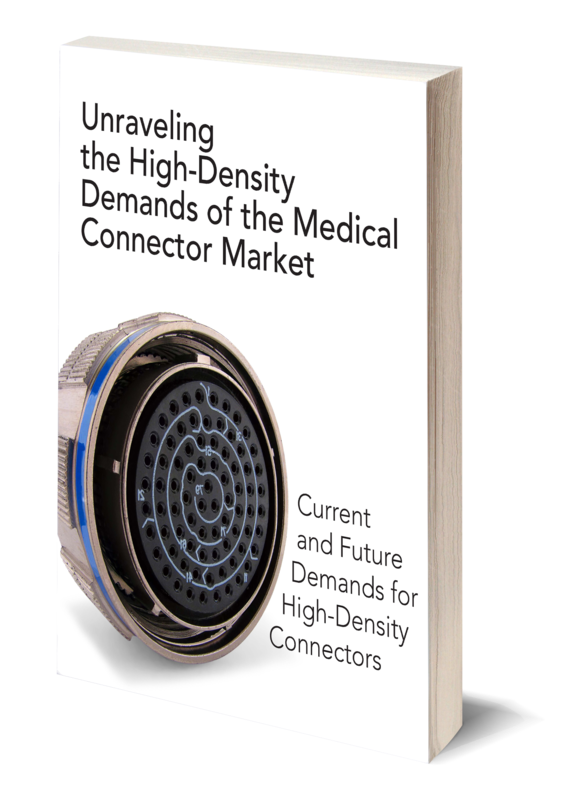 This white paper will explore why there is a growing demand for high-density interconnects, the engineering challenges associated with these interconnects, and solutions available to ensure each application is paired with the right interconnect. The need for high-density connectors is driven by a number of factors. In some applications, such as military and aerospace, the weight of components is a critical factor. By increasing the density of the contacts, connector bodies are kept smaller in size and thus weigh less. In other applications, without employing high-density geometry, connectors with a high quantity of pins would get too large to have good ergonomics, making the connector difficult to handle. There is an increasing need for high pin‑count connectors in the medical industry, particularly within the realm of cardiac electrophysiology (EP) devices. Cardiac Electrophysiology is the science of analyzing the electrical signals of the heart to diagnose various types of arrhythmia, including Atrial Fibrilation (AFib). The factor driving the need for a greater number of contacts in the connector in the EP space is the desire to create a catheter with a greater number of electrodes to improve both the speed of the procedure and the resolution of the cardiac map. The catheter shown in Figure 2 depicts 64 electrodes.To increase this number significantly (i.e. two, three or even four times as many) requires a high-density connector to avoid cumbersome solutions as the alternative—employing multiple connectors or single connectors—could approach the size of a soup can. To learn more about how ATL's high-density connector can benefit you and your project, download the whitepaper or contact an ATL interconnect consultant.